It is said that life begins at 40. If so, the Reading Aero Club has much to look forward to as it enters its’ fifth decade of uninterrupted existence. To the best of our knowledge, the club is the oldest continuously active flying club in the country. Though by no means the largest of its kind, the organization has maintained a unique status as a non-profit corporation in which all members hold equal shares and are eligible to participate in the running of the club. Over the years, the basic purpose of the club has remained the same, to encourage aviation in general, to acquire, preserve and disseminate valuable information and knowledge through books, lectures and pamphlets on the subject of aviation; to acquire, own and maintain aircraft, hangers, club house and personal property for the use of club members, and to promote the safe use thereof in the interests of the protection of public and private property. It is in this same spirit that the club has endeavored to set down in this history some of the background surrounding the early days of the club and, incidentally, the development of aviation in Reading since one cannot be described without considering the other. This sketch is by no means complete but we hope that it will be sufficient to engender some interest in the early days of aviation in Berks County. Aviation came formally but modestly to Berks County with the dedication in October 1927 of Whander Field, just south of Leesport. The field was the brainchild of John P. Wolfsinger, Sr., who was the chairman of the Chamber of Commerce aviation committee. At the time, there were several groups involved in casting about for an airport site; the Exchange Club had an active committee and the Council of Civic Clubs also initiated a study. It wasn’t until the mid 30’s that the groups finally got together for the purpose of providing Reading with a large commercial airport. 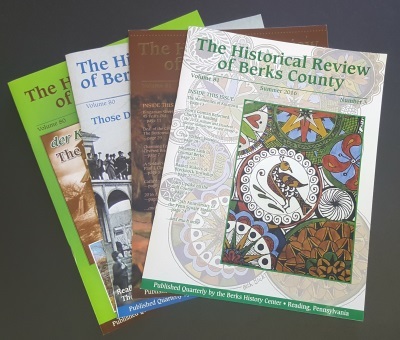 But, it was Whander field that served the area in the meantime by being a focal point for the birth and infancy of commercial aviation in Berks County. In the days of Whander field, aviation was a novelty and the “roaring twenties” in Leesport meant a mini-airshow almost every Sunday. The people would assemble early in the day to spread out their blankets and consume a picnic lunch while overhead there were demonstrations by either a parachutist, wing-walker or a thrilling stunt pilot. The entertainment was secondary, of course, since the original purpose of the field was to foster the development of the commercial aspects of aviation. 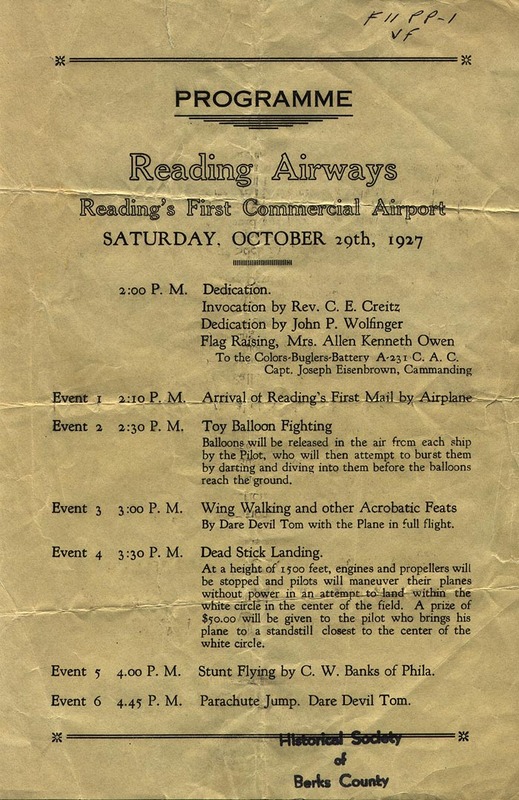 It was at this time that Reading Airways was formed, the first company in Pennsylvania to receive a charter for commercial flying. Since the application for a charter was the first to be made in the state, the question arose at Harrisburg whether or not the charter would have to be approved by the Public Service Commission. After nearly four months of hearings, the Commission decided that its’ approval was necessary in such cases, thus establishing a precedent for the state. Reading Airways was a very successful venture during its early years, as reflected in the operrating statement for the two month period from June 1, 1928 to July 31, 1929. During that period, the gross revenue from airplane operations amounted to $3,844.83. This revenue, according to the statement, came from 539 sight-seeing flights, special flights, long-distance flights, student courses and miscellaneous instruction. The airline offered the first commercial air links between Reading and the cities of New York and Pittsburgh, but schedules were erratic and the westbound flight frequently was terminated at Harrisburg due to bad weather over the Allegheny mountains. The year 1929 was especially unkind to commercial aviation and Reading Airways fell on hard times. Thereafter, Whander field became available almost exclusively for the use of private or “general aviation” as it is known today. Even though Whander field was the first “official” airport in the area, there were several other fields around Reading which were visited frequently by the hosts of barnstormers who toured the country in the years following World War I. Among these was Madeira field in Hyde Park, the County Home field near Shillington and a field not far from the Bingaman Street Bridge and to the north of Lancaster Avenue. It was at Whander field that a group of aviation enthusiasts began to realize the benefits of joint ownership of an airplane. From a purely financial standpoint, an airplane to be used for recreation was an unwise investment for all but a few of the flyers or would-be flyers who began making the field their “weekend home”. The advantages of joint ownership were seen to extend beyond dollars alone; a group having common interests could share amongst themselves the rapidly expanding wealth of aeronautical knowledge and everyone would benefit from the experiences and talents of each individual. Mr. Carl A. Reber, who had been associated with the operations of Whander field, was in the best position to form a group of joint owners. Fourteen men formed the core of the group with each contributing an equal amount to a fund for the purchase of an airplane. After studying the available choices and noting the scanty of spare parts, they decided to purchase two planes, one in good flying condition, the other to be cannibalized as required. These first two aircraft were Curtis Wright Juniors and were of the pusher type. Resembling a modern amphibian airplane in some respects, the single engine was mounted above and behind the pilot on a frame over the wing. The engine was a three cylinder radial design made by Szekely which developed 45 horsepower at full throttle. This particular engine had a reputation for occasionally blowing a cylinder and throwing rods but fortunately the worst never happened to the engine in the group’s Junior. It’s only fault was that the excessive vibration of the overhead mount sometimes caused the mounting bolts to become loose. This tendency was restricted by the application of several wraps of baling wire, the security of which became a part of the preflight checklist. It’s minor faults not withstanding, the Junior was truly a “fun” airplane, its big 391/2 foot wingspan provided very short take-off runs and landing rolls, a definite advantage in operating from the fields of those days. With a price tag of $1490., the plane was comfortably within the reach of the group. A committee was appointed to formulate a set of by-laws, provide membership cards and to design a club emblem. This committee was chaired by Earl Savage with Sam Celone and Carl Reber assisting him. Other members present at the first meeting were Luther Wenrich, Clarence Stein, Cleon Addis, Harry Cook and Victor Ray. The original concept of the club was that it would be developed around “units”, a unit to consist of twelve members who would have exclusive use of one airplane. It was decided that after two more members joined, the first unit would be complete and a second would then be organized for subsequent new members. Among other topics at the first meeting were the admission of “associate” members and the eventual organization of a girl’s group in the club to be directed by Mrs. Olive Hintz. The club’s meeting room at the airport was modest indeed, in fact, it was little more than a shed, deserving the nickname, “The Chicken Coop” bestowed by the members. Even with the oil heater turned up full, the members had to bundle up warmly against the cold draft. The field, however, was generally quite suitable for the club and membership grew steadily during the early years at Whander field. Three years after the club started, membership had grown to the point where more elbow room was required than was available at Whander field. So in 1935 the members decided to relocate to the newly opened Madeira field, opposite the Reading Fairgrounds. This location was more convenient to the membership, most of whom lived in Reading. Growth continued at a steady pace and another airplane, a Travelair biplane was purchased and the club members set about to build their own hanger to reduce rental costs. Not long afterwards, the opportunity arose to trade the Travelair for an Aeronca on very favorable terms. Since the Aeronca-lobby was more powerful than the Travelair-lobby, the deal was consummated and a tradition of airplane “horse-trading” was established in the club. Evidence that this tradition is still strong today can be seen whenever the club decides to trade-up to a newer or better equipped airplane, an event which seems to occur about every three years. It’s a bit like a family reunion where great uncles and distant cousins of the club not heard from for years suddenly appear, pass judgment on the aircraft under consideration, and then return to the corners of Berks County. While at Madeira field, the members became very endeared to their Aeronca and later demonstrated their loyalty to this sporty airplane by owning eight different Aeronca’s at one time or another. As membership in the club approached fifty flyers, Madeira field also became too small and the club decided it was time to try it’s wings and build a nest of its own. Finding an appropriate field took on an air of excitement as members scoured the Reading area by car and plane for a location close to the city, reasonably priced and having fairly unobstructed approaches. The site finally selected was a compromise of all the above. Joel Boyer’s farm, near Leinbach’s Hotel and about a mile north of the present Reading Municipal Airport, had a relatively flat strip of land comprising sixty acres which looked suitable for a runway. Mr. Boyer agreed to lease the land to the club and in September of 1937, the members began construction of the airstrip and hangers. By spring, there stood seven hangers along a respectable-length runway of twenty-four hundred feet which had been hewn from the farm. The official name became Berks Airport and it was one of the prettier fields around after the area was seeded and the, ladies auxiliary had established flower beds at several appropriate locations. The Reading Aero Club was fortunate to have had many dedicated flyers among its membership, a fact which has no doubt contributed to the club’s longevity. Earl Savage, one of the founding members of the club, is credited with the first air mail flight out of Reading in October, 1937. Probably the most famous of Berks County aviation pioneers was Clifton O. Hadley who was presented with a life membership in the club at a dinner in his honor in March 1940. Hadley operated a custom-made furniture business on N. 9th St. in Reading but his first love was aviation. In 1910, only seven years after the Wright Brother’s airplane lifted off and traveled the great distance of 852 feet, Mr. Hadley began flying in an airplane he had designed and built himself. A unique feature of the plane was a “Gate Control” for varying the pitch attitude. Invented by Mr. Hadley, it actually resembled a gate jutting out several feet in front of the pilot who grasped the control bar firmly with both hands while his feet controlled the wing-warping cables which banked the craft. Hadley later became Aeronautical advisor to the Reading Airport Commission and contributed several ideas to the layout of the Reading Municipal Airport. He maintained an active interest in the club and was credited with being a major contributor to the success of the club in those early days. In the after-dinner speech, Mr. Hadley praised the members for their effort in developing Berks Airport by “turning a mud hole into an airport”. He remarked that when the club was organized, some other members of the aviation community predicted that the club would be composed of an “outlaw group of pilots”, but that experience had proven their prophesy to be inaccurate. Instead, through the cooperative plan of the club, it was possible for the average man to enjoy the benefits of private flying. at reasonable cost and to be associated with a group of like-minded individuals who could help each other keep up to date on many facets of a fascinating interest. Perhaps the initial suspicion of the club was based on a fear of “cut-rate” competition, such a notion the club has hopefully been able to dispel among local fixed base operators. Then, as now, the club’s charter as a non-profit organization precludes it from engaging in sales, maintenance or instruction. The club does own and operate aircraft but, the entire expense of operation and maintenance becomes income to a fixed base operator. Thus, the growth and success of the club is beneficial not only to the club, but also to the commercial operators in the area. By the time America became involved in World War II, the Reading Municipal Airport was a reality. The official dedication took place on the weekend of October 7 and 8, 1939 and was momentous occasion for aviation enthusiasts of the Reading area. Several Reading Aero Club members served on the dedication committee. Among others, there were Mr. Hadley. Harold O. Landis, Clarence Rowe, Earl Savage and Paul Wenrich. Reading pulled out the stops by providing the public with an airshow that attracted and thrilled thousands. The program was opened with an hour-long band concert by the Reading Federal Band under the direction of Frank L. Diefenderfer. Then the Mayor’s official party arrived in an American Airlines’ Flagship and a United Airlines’ Mainliner. They were in turn followed by a reserve squadron of United States Navy planes. After a brief address by Mayor J. Henry Stump, the program got underway with ten spectacular “acts”. First there was a delayed parachute drop which elicited thousands of “gasps” as Jack Huber waited until he was perilously close to destruction before pulling the rip cord. Then came the usual assortment of aerial antics by famous stunt pilots of the day. A 1910 Curtis Pusher was put through its paces, there were demonstrations in a Piper Cub and smoke aerobatics by Mike Murphy, Roscoe Turner showed the crowd how to execute racing turns, Miss Bobby Lupton performed what was billed as “Lady Aerobatics” and Earl Eckel did gyrations in an autogiro. The finale was the “Batwing Parachute – Human Bird” in which Earl Stine floated down on target to an appointed spot on the airport. The club welcomed the opening of the Municipal Airport, its convenience to club headquarters at Berks Airport (only a mile away) made it easy to obtain maintenance from the commercial operations which were starting up at the field. But, the handwriting was on the wall with regard to the long-term future of Berks Airport. When the war broke out, there were people in the military who suggested that it would be convenient to close Berks Airport to allow unobstructed operations by army and air national guard aircraft. It was only the voice of a strong supporter, and then president of the club, Theodore “Hap” Gensemer, who was able to get a compromise worked out whereby club members could still use Berks Airport by staying within the confines of an arrival and departure corridor. The club rolls were at the time drastically reduced due to the enlistment in the service of many of the active members and it was felt that the closing of Berks Airport could have been a mortal blow to the club. Members who remained in the Reading area throughout the conflict were busy in Civil Air Patrol work and several pilots who later moved into military aviation were trained in club aircraft. Mr. Carl Reber, the first Vice-President of the club, flew CAP missions along the Eastern coast. The aircraft used were single-engine Fairchilds and Stinsons and the pilots were charged with tracking down enemy submarines. The real hazard of the job was compounded by the nature of the flights, up to one hundred fifty miles from shore in single engine aircraft weighted down with fifty pound bombs and depth charges which imposed severe limitations on the quantity of gas that could be safely carried. Except for an occasional cancellation due to a statewide blackout, the club continued with its regular meetings throughout the wartime period. Dues were doubled – to two dollars per month – to pay the salary of a full-time guard for the aircraft. In 1943, an all-girls flying club based at Madeira field, called the “Flying Ten Club” began negotiating with the officers of the Reading Aero Club for group membership. At first, RAC members were hesitant about accepting the girl’s but since the ladies had a Taylorcraft airplane in reasonable good shape, it was decided to accept them since their plane would make a worthy addition to the growing fleet of the club. After the war, the club grew rapidly and by 1946 it had 100 members ranging in age from 16 to 60 years old. Berks Airport continued to grow also and the seven airplanes belonging to the club were sheltered in two hangers reserved exclusively for club use. The squadron consisted of two Aeronca trainers, two Aeronca LC’s, an Aeronca Chief, a Taylorcraft and a Fairchild PT-19. The aircraft were all in good condition and the club enjoyed a solvency aided by a bank balance in September, 1946 of $3081. Until March, 1946, there was no system of prescheduling aircraft for a specific members’ use, the people would simply come out to the airport when they wished to fly and would take whichever plane was available. Eventually, this practice became too inconvenient and sign-up sheets were established so that members could choose specific airplanes for their use at specific times. Over the next few years, the employment picture brightened and the post-war expansion of the economy enabled many members to buy their own airplanes. Others began to raise families and found that the baby-boom had a direct impact on their flying budget. Consequently, membership in the club declined slightly. To make it easier for the club to gain new members, a new method of purchasing memberships, then becoming quite popular and known as the “time-payment” plan, was initiated for a trial period. The plan consisted of a fifty dollar down payment and $8.34 per month until the balance was paid. In 1950, the club acquired its first 4-place airplane, a Stinson Station Wagon for which the rate was set at $7.50 per hour. It was such a popular plane for family rides that the directors recommended a three hour limit for an individual pilots’ use on a Sunday. Throughout the 1950’s and early 1960’s, the club maintained and improved its quarters at Berks Airport and the membership hovered around 80 throughout the period. The field was a good place to maintain pilot proficiency in short field take-off and landing techniques, especially on a hot summer day with a full load in the plane. Disadvantages were that the grass had to be kept trimmed in the summer and a lot of the crystal-clear winter flying could not be done when hanger doors were snow-drifted shut. These factors, combined with the prospect that the field would soon become the site for an industrial development, caused the club to seek quarters elsewhere. On April 13, 1965, the club appointed a committee to investigate leasing a space at the Municipal Airport. The committee met with members of the airport authority and indicated to them that the club would like to occupy a permanent place at the airport. After receiving the approval of the authority, the club entered into negotiations with the Reading Aviation Service, Inc., to lease a meeting room from them. A suitable building was located at the west ramp of the field adjacent to the hanger where the club today keeps its’ airplanes. The level of sophistication in private flying has increased enormously in the last forty years, with the most significant changes occuring over the last twenty. Where the club could operate five or six basic aircraft in 1952. which were equipped with little more than “needle, ball and airspeed instruments”, today the club operates two well-equipped Piper Cherokee airplanes. Each is 4-place and each is fitted out with a variety of electronic equipment to allow members not only to operate in and out of our larger airports but to have available to them equipment which is advanced enough to allow them to pursue higher levels of proficiency. This increased level of sophistication in general aviation aircraft and the higher levels of pilot proficiency required go hand-in-hand with the development of more modern facilities in all phases of aviation. The pilot of 1932 was content to make patterns above Whander field for an hour or two on a sunny weekend. In contrast, today’s private pilot may go up on a weekend to practice but his practice may now include making instrument approaches or flying “under the hood” while a fellow pilot keeps watch. The purpose is a practical one, to allow him to take the family on a weekend vacation several hundred miles away and be reasonably confident of not being “weathered in”, or to simply build his own confidence in aircraft handling and thereby get much greater satisfaction from an interest which is already satisfying and most definite habit-forming.